I can’t begin to put into words how travel has enriched my life over the years. I’ve learned to see the world from a more educated viewpoint. I’ve eaten marvelous foods that I couldn’t even pronounce. I’ve been heartbroken to see those less fortunate than me, wondering if I could last a day in their shoes (or lack thereof). I’ve seen indescribably beautiful places with my own eyes that I had never even thought to dream about. I’ve learned to appreciate what I have and be thankful for the opportunities that have come my way. For me, travel is catharsis. Travel is learning. Travel is a privilege. But lately, I’ve seen too many people treat traveling as a right, especially on airplanes and in airports. July saw one of the most outrageous incidences in recent memory when a British man was charged with disorderly conduct, assault and battery and disrupting the operation of an aircraft causing his London to Houston flight to divert to Boston. His alleged bad behavior involved yelling at other passengers, pushing flight attendants trying to calm him down, striking his wife and finally urinating in his seat. I wish I could say that incident was an isolated one. But no, just last month a drunk passenger headed to Portland, US woke up shortly before landing and began relieving himself. “Approximately 30 minutes prior to landing he stood up and began urinating through the cracks of the seat onto the passengers seated in front of him,” the police report said. “At some point Jeff Rubin lost his balance causing him to fall backwards and urinate upwards which got on the passengers and seats next to him as well as some other passenger’s personal belongings.” Talk about a nightmare flight. Not sure how you recover from that. There’s something about travel that seems to make people feel free from the constraints of normal life. Early party mode? Like the 14 men traveling from Glasgow to Tenerife who were so rowdy, drunk and threatening that the flight had to be diverted and the offending parties banned for life from Jet2.com? Or maybe putting yourself in unfamiliar situations triggers bad judgment. That seemed to be the case for one Chinese woman who couldn’t take a 700ml bottle of Rémy Martin XO Excellence through airport security. Instead of ditching the USD200 bottle, she stood there and drank it all. By the time she was done, she couldn’t stand up and was deemed unfit to fly. I think all of us may have done something similar, like eat a piece of banned fruit before going through Customs, but to exercise such lack of judgment to the detriment of your own health is a head scratcher. Another contributing factor is the reduced cost of flying. With so many budget carriers, flying is within the financial grasp of more people than ever before. That also means there are more first-time or infrequent flyers who haven’t a clue on flying etiquette. In August, photos of a Chinese woman letting her child defecate in the rear of a plane in China emerged online. Why she didn’t choose to use a bathroom or a diaper is anyone’s guess. Vietnam made international news when a pop singer allowed her 4-year-old son to urinate into a sick bag in his seat on a Vietnam Airlines flight. Add to that the all-too- frequent reports of Vietnamese flyers opening emergency exit doors, stealing life jackets, food trays and other accessories and abusing airport personnel, like the April incident where a woman slapped a VietJet employee who wanted to weigh her carry-on. I’ve been on countless flights where shoes quickly come off and bare feet are pointed in all directions or people watch movies on mobile devices or laptops without headphones. Last week, I sat across from a man who thought the airport lounge was a good place to shave. It’s clear that the Golden Age of Flying is long gone ― the days where people dressed up to fly, there were no security hassles and you actually looked forward to airplane meals served with real cutlery. In the days since, flying has become more accessible, but also significantly less comfortable. To make up for cheaper fares, airlines are stuffing more people in the same amount of space, reducing the seat pitch and leading to clashes between passengers who feel they have the right to recline wherever, whenever. I was on a 45-minute flight last week when the person in front of me immediately reclined his seat all the way back on a small turboprop plane. To keep up profitability, airlines are also decreasing services like meals and beverages as well as personnel, meaning more lost baggage, more oversold flights as routes are being consolidated, and more delays as airlines are using fewer planes and turning them around faster. People are bringing on more and larger carry-on to avoid paying baggage fees. Overall, the “friendly skies” aren’t so friendly anymore. But there are things you can do to insulate yourself to the extent possible as well as avoid being “that guy” who makes flying miserable for others. Be polite. This includes flight attendants and fellow passengers. Flight attendants aren’t servants, so don’t expect them to help you lift your carry-on (it’s not part of their job description). A smile and “hello” might just be remembered when it comes time to helping you find an empty seat (or row) away from a potentially annoying seatmate. Respect boundaries. You know that t-shirt with a big expletive on it that’s so comfortable to wear? Do everyone a favor and leave it at home. Same goes for ultra- revealing clothing, perfume and aromatic foods. If you must take off your shoes, please wear socks. Clean socks. Bare feet in other people’s space is never okay as is any type of personal hygiene maintenance. We’re all in this together. Literally. Don’t hog the overhead bin. It’s meant for one piece of luggage per passenger. So hang on to your jacket and purse and put it under the seat in front of you. Once the doors close and there’s still room, by all means, use whatever storage is available. Also, when you stow your luggage, put it in front-to-back to take up the least amount of space possible. Plan ahead by packing a tote bag (or even a plastic bag) with things you’ll actually need on the plane instead of waiting to get to your seat before fiddling with your luggage, thereby holding up the line. Minimize disturbance to others. This includes using seats for balance, either as you’re walking down the aisle (use the overhead compartments instead) or getting up. Instead of grabbing the seat in front of you, use your arm rest. As you’re boarding the plane, considering holding your bags close to the ground instead of around your shoulders where they’ll hit fellow passengers as you walk by. If you have to recline, take a quick look behind you first. If the person is on a laptop or filling out a form on their tray table, perhaps just wait a bit or tell them that you’re going to recline. 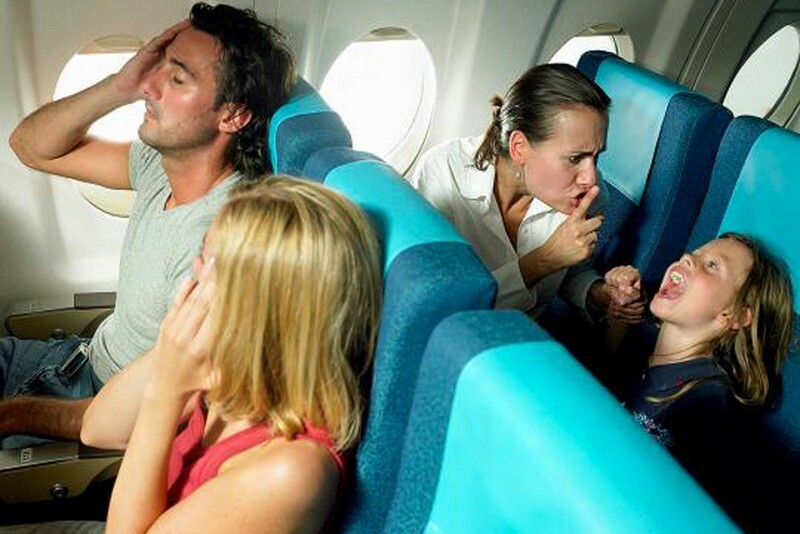 If the flight is less than three hours, consider whether you really need to recline at all. Mind your children. Flying is tough on kids who find it difficult to sit for long stretches and who might be more sensitive than adults to air pressure changes or motion sickness. In addition to trying to calm your child down during the flight, pre-planning is imperative: bringing along snacks and drinks, a tablet with their favorite movies, having them well-rested, and avoiding red-eye flights when everyone is trying to sleep are good starting points. I’ve known families who choose seats in front of each other, rather than in a row, so that if the child must kick a seat, it’s their parent’s and not someone else’s. But despite the best-laid plans, sometimes kids just act up. I’m much more sympathetic when I see a parent trying to do their best to keep their child quiet instead of simply ignoring the noise. Be judicious with alcohol and medication. Yes, you’re on vacation and deserve to kick back a little. But alcohol, combined with air pressure and possibly sleeping pills that might wreak havoc on your system make for a bad combination. So perhaps stop drinking long before you’re intoxicated and switch to water or juice. Save the partying for when you land. Above all, relax. Travel rarely goes off without a hitch. Insulate yourself with a good pair of noise-cancelling headphones and your favorite movies or magazines to make the time pass. A sleep mask, neck pillow and whatever helps you be more comfortable can also go a long way to helping you make the best of your flight. Bon voyage!